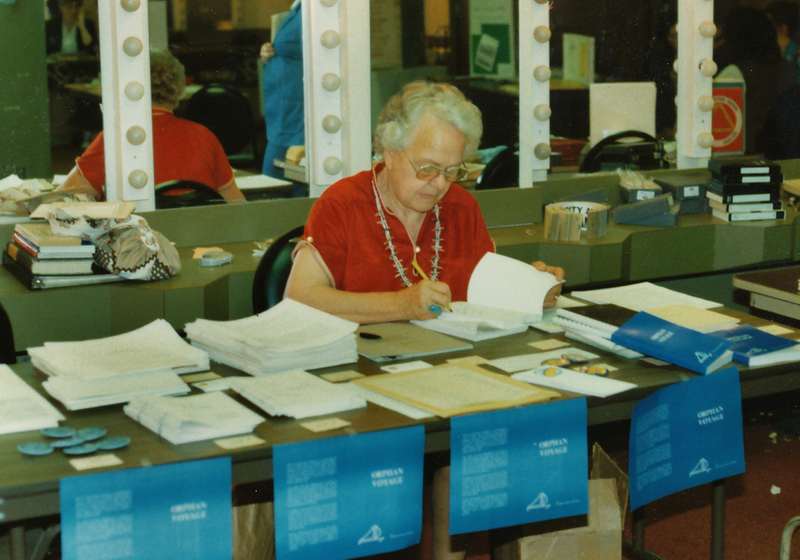 This is a photo of Jean Paton busily signing copies of her book Orphan Voyage at an American Adoption Congress (AAC) national meeting probably in the early 1990s. Although Paton had the original idea for a national organization for adoption reform, which eventually turned into the American Adoption Congress, her subsequent relations with the organization were tumultuous. Paton’s relationship with the AAC hit a low point in the early 1990s over the question of registering for the 1991 national conference in Garden Grove, California.. When Jean requested a table in the bookroom/exhibit area, the ACC Conference Registrar told her that requests for table reservations had to be accompanied by a paid conference registration. The request angered Paton because 1) she had no plans to register and 2) she thought it an injustice to demand a paid registration from “the mother of the movement,” who had impoverished herself for the cause. She threatened to carry her books on her back and if people asked why, she would reply that the AAC denied her a table. The upshot: The AAC maintained its position; Paton attended without registering. Posted on December 8, 2009, in Jean Paton and Social Movements and tagged American Adoption Congress, jean paton. Bookmark the permalink. Leave a comment.